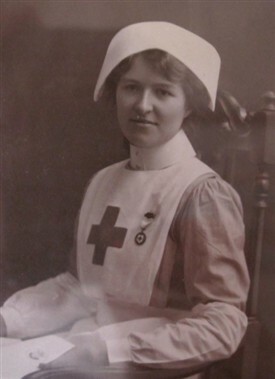 In the article ‘Comfort for Troops in WW1’ http://www.ournottinghamshire.org.uk/page/comforts_for_troops_in_ww1 John Pownall describes how Miss B Whitby organised and dispatched parcels to British POWs during WW1 as Honorary Assistant Secretary to the Nottingham Comfort for Troops Committee. Miss Whitby was awarded the MBE in 1919 for her wartime charitable work. Beatrice Mary Elizabeth Gee (née Whitby) MBE was my maternal grandmother. She was born at home at 33 Manor Street, Sneinton on 12 July 1892 to her parents Seely and Elizabeth (née Chettle). Seely Whitby was a Provisions Merchant Manager for Allcock’s on Smithy Row (on the Council House site). He was an active teetotal social reformer working for various organisations, including the Red Cross, Salvation Army and the Liberal Party (he became Lord Mayor of Nottingham in 1933). When the proprietor of the Daily Express Arthur Pearson set up his Fresh Air Fund to provide holidays for poor children in 1892, Seely set up a branch in Nottingham. In 1894 he raised funds for a party of 200 young poor children to go on a short holiday to Scout Farm, Mapperley. He also had his own comfort fund which he operated from home, and sent balaclavas, mittens, scarves and cigarettes to soldiers in the Boer War (1899-1902). It was in this context of charitable social reform that Beatrice was raised. After short periods at Miss Chapman's private school in Belvoir Hill, Sneinton, aged four and at a local church school, she was educated until eleven at Sneinton Board School, from where she got a scholarship to Mundella Girls School. She liked school but not the homework, and left aged 15 to work at Morley’s and Armitage’s, selling sweets and cakes. Her charitable work started at a very early age. When she was just eight she knitted a scarf for a soldier in the Boer War and got a letter back which she still treasured in 1974. In 1903, her father asked her if she would like to hold a Backyard Bazaar rather than have an 11th birthday party. Seely wrote to all the grocery suppliers, and she was given items like miniature bottles of HP sauce, and scented soaps. A councillor opened the event, and the money was sent to the Pearson’s Fresh Air Fund in London, paying for 200 poor children to go on an outing in Wollaton Park. 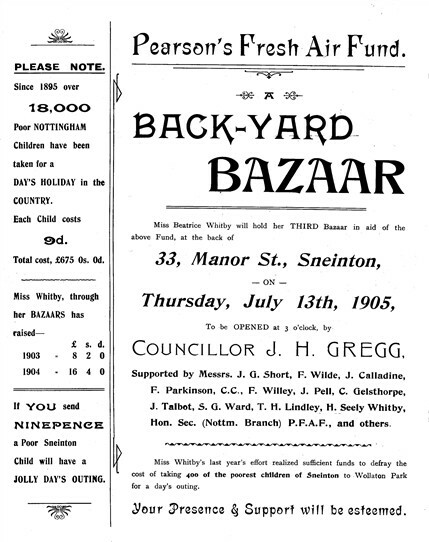 A pamphlet for the 1905 Backyard Bazaar suggests she held parties in 1903, 1904 and 1905, raising £8 2s 0d in 1903, and £16 4s 0d in 1904 - the latter being enough to support 400 children on a trip to Wollaton Park. Beatrice worked at Armitage’s for four years, and then helped her mother at home for the next three years. She used to go to Red Cross meetings and night school, where she learned book-keeping, shorthand and typing. From her own words on a family tape recording, during WW1 both Seely and Beatrice became involved in the Nottingham Guardian subscription fund which collected up to £2000 per day to send parcels to Germany containing dubbin, mittens, chocolate and cigarettes from the Red Cross office in Washington Buildings on High Pavement (provided by a lace manufacturer). During WW1 there were 1200 Nottingham POWs, each of whom received a parcel every 5 days. 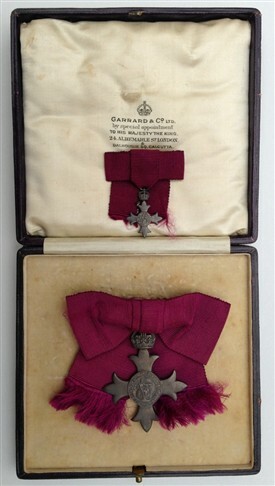 She obtained the MBE for her wartime work in 1919, aged just 26 (or 27). She was given her MBE by the Duke of Portland as the King was ill on the scheduled day. Beatrice’s brother Henry Seely Whitby joined the Royal Flying Corps in WW1 as a pilot and later an instructor, and he was awarded the Air Force Cross. As Polly Russell notes: “On civvy street in 1914, plum pudding and chocolates would have been standard Christmas fare, but for soldiers far from home they were a weapon to wield against despair, sent as reminders the ‘the people of the City and County of Nottingham’ had not forgotten them. A fundraising drive for Comforts for Troops had been publicised in the Nottingham Guardian on 16 November 1914. Readers were encouraged to donate ‘one shilling and upwards’. Within a day the paper had listed 100 donors. According to a typed account of the charity’s business, 5,000 parcels were dispatched from the fund in less than a fortnight. On 24 May 1918, the Nottingham Evening Post wrote that: “No city in Great Britain has more generously and promptly cared for its prisoners of war than Nottingham. Between 1915 and 1917, inclusive, the Comforts for Troops Fund has sent out over 40,000 parcels to men in Nottinghamshire regiments who have had the misfortune to be interned in Germany, and the numbers have recently been at least 600. Until a month ago, six parcels were sent each month to 450 men, and a special effort is called for to meet the increased demands. That takes practical form in to-morrow's flag day, and the citizens are to be asked to double their customary contributions to an eminently deserving cause. Two former Sherwood Forester prisoners, Walter Farrow and Harry Matthews, who had been repatriated due to ill health, were interviewed about their experiences in the Nottingham Evening Post on 28 May 1918, recalled on the Small Town, Great War: Hucknall 1914-1918 website https://www.facebook.com/117600881609310/photos/pcb.1009222842447105/1009222642447125/?type=3. “IN HUNLAND PRISONS. SHERWOOD FORESTERS' GRIM EXPERIENCES. THE TRIALS OF NOTTINGHAM MEN. Nottingham men, not yet wholly recovered their grim life as prisoners in Germany, but happily revivified by their return home, took an enthusiastic share in the recent flag day for the Prisoners of War Comforts Fund. Both the gallant fellows — Private W. Farrow and Private H. Matthews — wear the badge of the Sherwood Foresters and both, in conversation with a Guardian representative, spoke terms of unstinted gratitude for the parcels which the city of Nottingham, through its Comforts Fund, has since the first year of the war systematically sent, month by month, to those of its sons who have been fated to endure the hardships of enforced confinement in German camps. 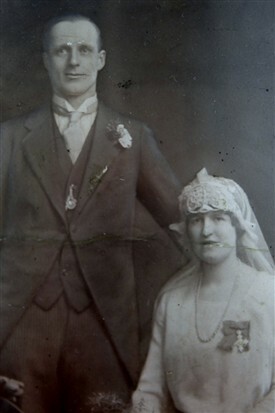 Beatrice - wearing her MBE - and Tom on their wedding day in 1923. Beatrice met my grandfather Thomas Gee (a disabled WW1 veteran) when Gee’s Pork Butchers of Radford Road, Nottingham replaced Wagner’s as suppliers of sausages to Armitage’s (because of the association between the name Wagner and Germany). They married in April 1923, and had four children and nine grandchildren. Beatrice and Tom retired from the Radford Road shop to Ruddington in the 1950s, where she lived until her death in 1977. My mother Alice Caulton (née Gee) was Beatrice’s eldest child. We displayed many of the embroidered postcards sent from POWs on the walls of our family home in Sherwood. We also had an illuminated manuscript given in gratitude by the Sherwood Foresters to my grandmother after the war, and this now proudly hangs at my current family home. This page was added by Website Administrator on 21/09/2016. Many thanks for producing this article about your grandmother; it is a very comprehensive article indeed. It has certainly quenched my curiosity about this lady. It is as I suspected; she was an industrious hard working lady. 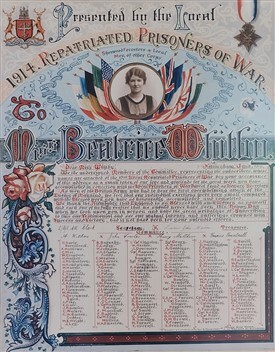 I am pleased that you have inserted photos of her and the poster of appreciation from the repatriated Nottingham soldiers. This article will certainly record her achievements on the internet for all to see, especially the photograph of her in uniform. My grandfather Samuel and his brother Arthur were born in Sneinton during the 1880s. They were at the other end of the social spectrum; living in poverty. It passed through my mind if they would have known of each other? They would have certainly have needed and appreciated any help available during those times. One last thing, Arthur Pownall was selected to be one of the first soldiers to be written to, why I have no idea. Maybe it was due to the fact he was taken prisoner during the first days of the war at Mons. Possibly his name was one of the first on the list of soldiers reported as prisoners. However, this article about Miss B. Whitby is very enlightening about a Nottingham lady. So thank you very much, this has helped me to add a little bit to my family history during WW1. Thank you for inspiring me to tell my grandmother's story. It is fascinating that we can relate the intertwined stories of your great uncle and my grandmother on this website 102 years after the event. I am not all sure that the Pownalls and the Whitbys were at the other end of the social spectrum. Manor Street in Sneinton does comprise well-built terraced houses: the Whitbys were moderately successful in trade, but they were certainly not a wealthy family. They associated with the wealthy through the remarkable social reforming activities of my great grandfather, Seely Whitby, and his daughter. In later life my grandmother was very modest and rarely talked about her WW1 experiences. It was simply something that 'you did because you could'.